At Apex Storage, we take our responsibility of looking after your valuable personal belongings very seriously. This is why we provide as much security as possible, and always use high-quality security technology. Along with our security gate guarding the entrance to the facility and our 24/7 on-site management team, we also have security cameras in place to provide the highest protection possible. Video surveillance is one of the most effective tools to prevent theft and reduce the risk of crimes such as vandalism or theft. 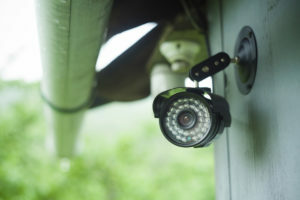 Security cameras serve as a warning to criminals that they will be held accountable for their actions and prosecuted to the fullest extent of the law. And if something were to happen, the footage provides invaluable evidence of the crime, and can aid law enforcement in finding the perpetrators. This is why we have security cameras placed throughout all of our facilities. They provide 24/7 footage in 4k resolution to ensure that your belongings are well-guarded and secure. Our locations are busy, with people frequently coming and going, and the cameras help us to minimize the amount of theft that occurs and safeguard your valuable possessions against would-be robbers. Our 24/7 on-site management team constantly monitors the footage. This helps us prevent break-ins from happening, but it also allows us to report any incidents immediately to local authorities so that if someone were to steal something, they wouldn’t make it far. When you trust us with your personal belongings, you can rest easy knowing we are doing all we can to take good care of them and protect them from vandalism or theft. If you have any more questions about the security measures we provide or anything else, give us a call today!